2017 was a great year for mobile app development- more companies are now aware that mobile apps are no longer just an optional investment- but a necessity. They are an optimal way of meeting customer demands and increasing sales. Statista writes, “50 billion app downloads jump this year, 197 billion in 2017 versus 149 billion in 2016. According to a projection, by 2021 the total app downloads number will jump to a stunning 352 billion”. Therefore, needless to say, mobile app development is one of the most actively growing sectors in the industry. Gaming apps, subscription apps (music/video streaming), dating apps, make the most dough but social media, lifestyle apps definitely dominate the market. Large companies in every sector, especially retail, hospitality and banking are utilizing apps to increase their customer engagement, branding and marketing etc. Meanwhile, SMEs are following the trend and creating their own apps. Here are the top 10 mobile trends in app development that will not only dominate this year but will define the future of app development. Since Google first introduced its AMP project (way to improve the web page load time) it has been gaining attention increasingly. With AMP- you can now see the quick loading of web pages on your mobile. Besides from this incredible function, Google has also declared that it will provide an isolated search index for the mobile web- from an SEO perceptive- this, changes all about mobile app development approaches. Other benefits of AMP include- increased visitors and ad visibility, higher CTR and page ranking, easy content placement and visitor analysis, mobile search index, lesser migration efforts and mobile search carousel. Within a short span of time- blockchain has gained widespread popularity as the infrastructure behind bitcoin. Blockchain will be used widely by developers as an incorruptible digital ledger in the new year while developing financial apps. In 2018, they will leverage the shared incorruptible digital ledger to a variety of financial transactions and record transaction history. While doing the enterprise mobile app development, developers will utilize blockchain to improve app security and data by removing the probability of data tampering. Further customizations of blockchain will enable us to record diverse types of valuable and sensitive transactions. “As the foundations mature, we will see major advancements in the usage of blockchain solutions for consumers… Whether it be personal electric grid management, digital identity, gaming, loyalty or credit scoring, we will probably use a blockchain app in 2018” said Coin Desk about blockchain apps. Android instant apps are basically native apps that function like websites. They are convenient and work in favor of attracting more users. The need for app installation is eliminated here which erases the barrier in between the apps and web. It is easier to share and runs flexibly in all Android versions- from jellybean to the current version. You can also access apps from anywhere without installing on the device. Another benefit is that you save space on your smartphone – since there is no unwanted app downloading required. More and more companies are supporting BYOD which is an acronym for “Bring Your Own Device” model, we will witness an uptake in hybrid enterprise mobile application trends. In fact, 72% of companies have already started investing in BYOD for employees in one way or the other. According to Markets and Markets, the BYOD & Enterprise Mobility Market will be worth a whopping $73.30 Billion USD by 2021. Hybrid apps are known to run in the app form, however, they are primarily mobile websites. This assists in cost reduction and speeding up the mobile app development process. Currently, AR and VR are widely used in gaming and entertainment apps. The developers use AR to deliver a live view of the real-world environment and VR to redevelop real-life situations or the environment. With major tech companies increasing investments in VR and AR projects, the demand for the said technologies will definitely increase in 2018. Most developers explore ways to develop innovative apps by leveraging AR and VR. While AR will be used extensively for developing enterprise apps (for diverse industries retail, real estate, healthcare and engineering), VR will be used widely for game development. The benefits of AR include – it enables the products/services to be presented in detail with the assistance of a visual experience for clients, it can be used for employee training in high-tech method (to increase productivity), companies can show their audience the relevance of their products in real-time. The benefits of VR include – it enables promotion of products utilizing a blend of photography and technology- which makes the processes more interactive, it allows product showcasing in virtual showrooms without using much space and can be used for marketing and company branding. Artificial Intelligence has the capability to revolutionize both enterprise app development and consumer-facing in 2018. Apps are getting more intelligent and learning to anticipate user’s preferences. Be it cybersecurity, virtual assistants or IoT- everyone is focusing on the way towards AI and Machine Learning. It will help developers in making apps that can be used as a robust tool to access real-time insights via machine learning technologies, cognitive interfaces and advanced analytics. The AI market is expected to witness a growth of $47 billion by 2020. Chatbots are a fastest growing technology, with the market growing at the CAGR of 37.11%. It is forecasted to reach a booming $6 Billion by the end of 2023. Business bots, when combined with mobile app, offer a way of creating simulating customer interaction for business. Statistics say that in 2018- 65% of US consumers are likely to interact with chatbots. Most popular chatbots developed last year are Financial assistant chatbots (ENO), weather forecaster chatbot (Poncho), virtual medical chatbot (Melody). More and more developers are investing effort in developing cloud driven apps. With increasing use of cloud technology- it has become much quicker and simpler to get data without affecting the internal phone mobile phone memory. With Google Drive, Dropbox – and various other cloud based apps- an increasing number of apps will become cloud driven. As per Statista, “in 2016, the global cloud application market had a value of 56.9 billion U.S. dollars”. According to the report, the value will reach $69.4 billion in 2018 and $85 billion in 2021. Meanwhile, Cisco VNI Global Mobile Forecast states that cloud apps will influence 90% of total mobile data traffic by 2019 worldwide. Cloud based apps are also appealing for enterprises as they would mainly lessen the security issues that are so inherent in BYOD (Bring Your Own Device). Customers engaged in online shopping through mobile applications have been using internet banking or credit/debit cards for payments. The introduction of Google Wallet and Apple Pay, though have people gradually shifting to m-commerce. While the trend was strong in 2017, the mobile payment trends 2018 will be on a whole another level. It will be a good way for organizations to harvest data and offer in-depth analysis about clients. Customers will get more comfortable with this payment option. “Predictive Analytics is the use of statistical techniques of data, algorithm and machine learning to analyze current and historical data to make predictions about future outcomes and trends” explains the Hakuna Matata Blog. By bringing this in app development, you can optimize the app delivery pipeline with the best estimates of time, effort and cost. It can detect risks, opportunities – all the while eliminating bottlenecks and increase the quality and relevance of the app. It has already been implemented by Google, Facebook, Apple and IBM as well as other tech giants. The concept of smart home, smart cities, industrial IoT, smart retail etc. is growing quickly. From healthcare to education, IoT mobile app development is taking off and are becoming mainstream in 2018. This boom of IoT has created an urge of intuitive computing technologies. Edge computation is the way to do this. Wikipedia explains “It basically pushes the data, application and computing powers away from its centralized points to the logical extremes of the network”. Large of tech giants are already started investing in the hardware and software in edge computing. Google Beacon and Apple’s iBeacons, both of which are Integrated location-based service applications are really popular. Today nearly 100% of smartphones come with Beacon and GPS capabilities to leverage offerings of LBS (location-based service) in full potential. The usage of wi-fi will no longer be restricted to retail outlets, restaurants, hotels and in healthcare. The utilization of apps with Wi-Fi support is going to increase beyond these traditional requirements- which will assist people with relevant location-based information. This technology gives a major scope to personalized app marketing. Since the beginning of smartphone technology, there has been a continuous demand for excellent security. More and more users are feeding and managing confidential data in smartphones and this will continue to grow in 2018. What this trend needs, however, is the security measures that must be applied to keep this information secure. In fact, Network World estimates that “70% of mobile professionals will conduct their work on personal smart devices by 2018”. A research by HP discovered that 70.6% of apps have access to the external storage of your smartphones and meanwhile 94.7% of apps have logging techniques that get stored in your phone’s cache. In 2018, developers will be focusing a lot on developing apps that have built-in security features. One of the fastest emerging application development trends this year are the gesture-based UIs. The gesture-driven user interfaces lead to less clutter, seamless interaction and they are easy to use. Gestures are believed to supplant clicks in the future. This technology has influenced countless mobile games that depend heavily on swipes. Android games such as Clash Royale, Hearthstone, Toy Crush are good examples of this trend. Technologies that are geared towards minimizing the resources consumption on devices like Lazy loading, battery-efficient and lite apps help apps reach more users globally. Aside from that, such apps will be more evident in Google Play Store. Plus, with Google’s guide for Android developers- more developers are likely to make more efficient apps and games in order to meet the requirements of billions of users worldwide who have less-powerful Android phones. 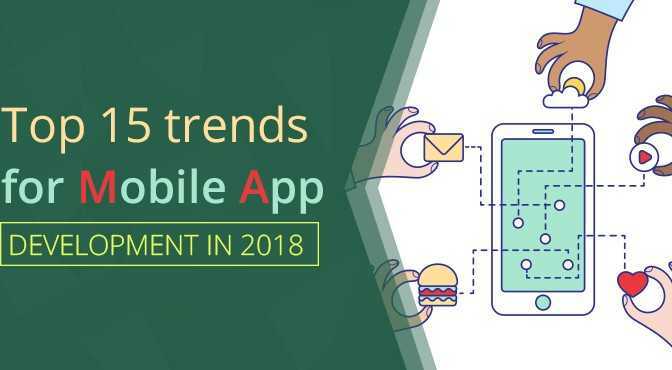 Overall, there are many emerging technologies in mobile app trends that a developer has to adopt in 2018 in order to make their app more popular, relevant and as profitable as possible. All the while, it must be noted that disruptive technologies can sprout off new trends and as result change the development process. Thus, to be successful- a developer must always be on the lookout for changes in the mobile app development.